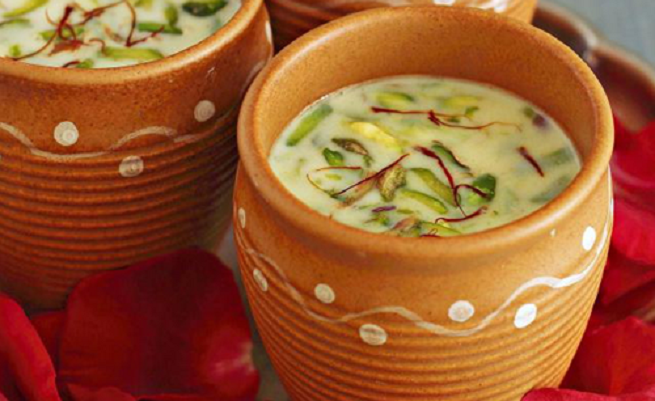 8 appetizing Holi special delicacies Indians love to binge on. Festivals in India are not only about the pomp and show – it’s more of getting together with loved ones, enjoying the traditions and relishing the most amazing food. Indeed, every Indian festival brings along a peculiar trail of special delights and Holi – The festival of colours is no different! Spring is the time in India when winter is fleeting and summers are slowly setting in – making everything in the atmosphere give fresh and sublime feels. Apart from the nature’s renewal, spring is also the time which marks the most colourful festival of India – Holi. Holi is one of the most-awaited festivals in India. It is the occasion when people love to smear each other in frisky colours. Kids play with water guns filled with excitement and mischief. And older ladies exchange plates mounted with festive goodies. Holi is indeed a festival which brings out the playful child in each one of us. The word “Holi” was acquired from the word “Holika”. In Hindu mythology, Holika was an evil sister of the demon king Hiranyakashipu. On the eve of Holi, a bonfire is lit wherein an effigy of Holika is placed on a heap of woods and burnt. This signifies the ‘Holika Dahan’ which sets out the Holi celebrations. Along with all the celebrations, the one thing which makes this festival all the more special is the vibrant, lip-smacking delicacies. 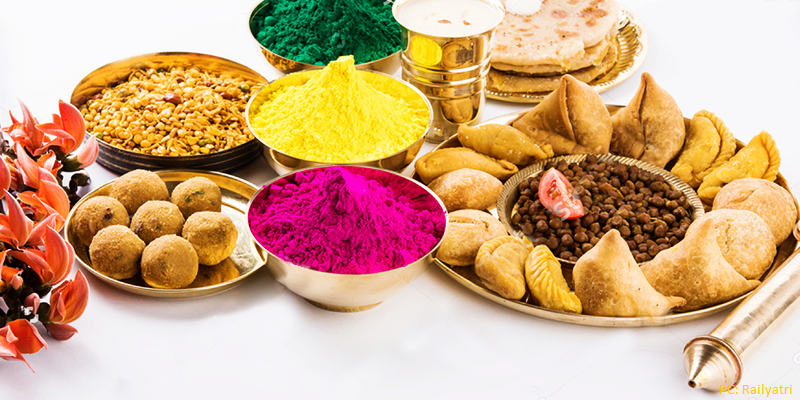 It is not only the bevy of colours that Indians look forward during Holi, but all the sumptuous snacks and sweets which are prepared especially for the occasion. Gujiya is the star delicacy of Holi. 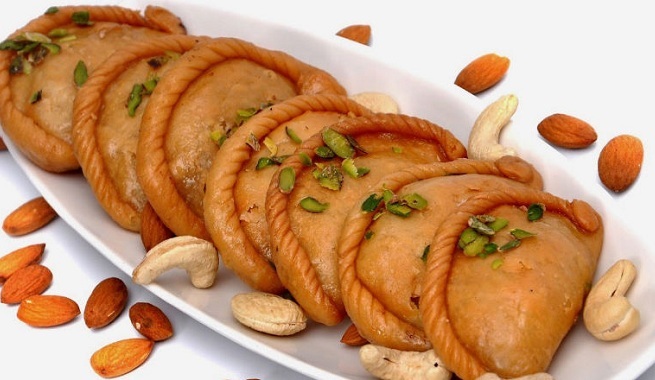 These sweet dumplings are made using refined flour, condensed milk, and stuffing of khoya with dry fruits or nuts. Gujias are native to Rajasthan, but is widely made all around the country with much fervour. Though the making of Gujia requires time and effort, the tase of this delicious sweet makes it all worth it! The crust of Gujia looks similar to samosa, the shape however is distinct. Gujia is filled with a mixture of roasted and grated dry fruits, coconut, khoya and small amount of suji (semolina) to give it a fulfilling and mind-blowing savour. 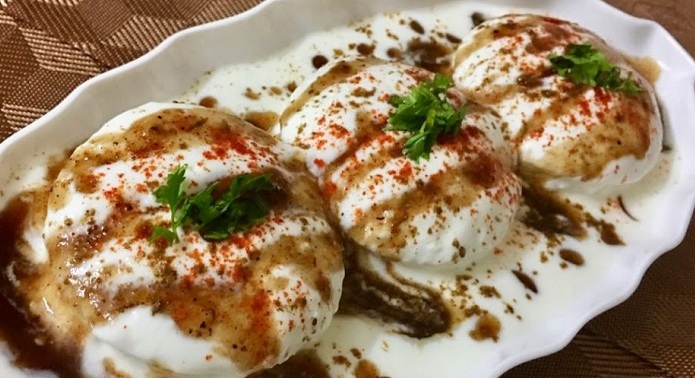 Dahi bhalla is one such Holi special foods which can make anyone drool over it. This lip-smacking Indian dish comprises of soaked fitters, made from chickpea flour, lentil or potato doused in dahi (yogurt). Topped with chilli poweder, chaat, masala, black pepper and cilantro make it more mouth melting. 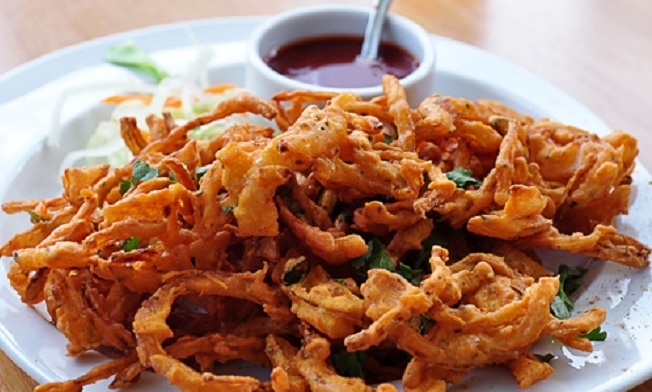 Made with vegetables, particularly – onion, this is a type of fritter especially made during Holi celebrations. 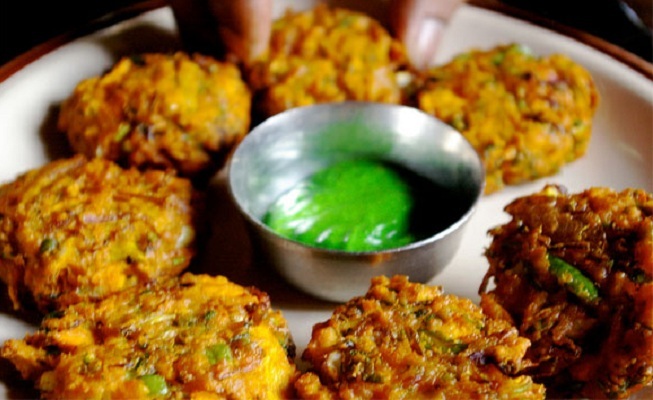 It is also known as Vengaya Bhaji and is consumed with a green chutney making it taste all the more delicious. Cannabis or marijuana is locally known as bhang in India. Bhaang is being consumed during Holi in India since centuries for recreational purposes. It is a popular intoxicating drink and is revered to be an auspicious drink which Lord Shiva used to consume. There is also ‘bhang ki chutney’ made to kick start the Holi festivities. Holi in India and thandai go hand in hand. If you talk about Holi in India, Thandai itself makes its way. Thandai is a concoction of fennel seeds, almonds, nuts and saffron with milk as a base ingredient. Often, bhang is added to give it a zesty kick. At the time of Holi, guests are welcomed with this aromatic drink. This variety of Kachori is North Indians’ one of the most loved snacks. And you will know it once you take a bite of this crispy and stuffed delight. 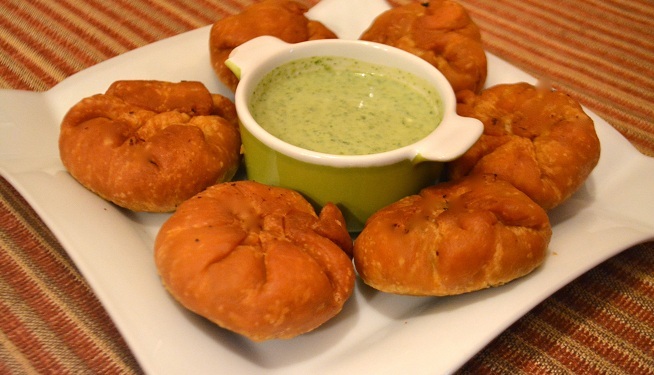 Dal Kachori is stuffed with arhar dal, spices and fried crisp. 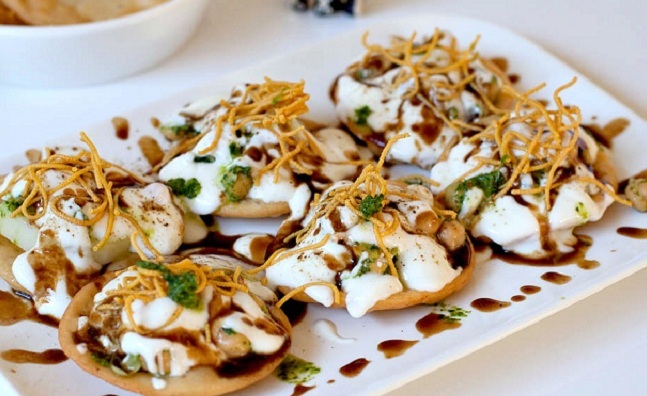 This gorgeous looking chaat is equally delectable. Papri chaat is a fusion of curd, boiled potatoes, chutneys, chaat masala and topped with crispy papris (fried wafers). The papris used are either readymade or made at home using refined white flour fried in ghee or oil. The dish leaves a sweet and sour savor in the mouth. Indians’ favorite tea-time snacks – Namak Para is also a Holi special savoury. 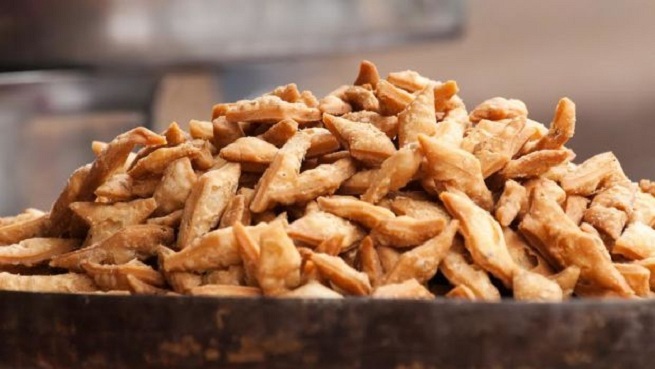 The dough of Namak Pares is usually made of flour mixed with suji. Then small strips out of these dough are rolled and deep fried. Namak paras are a perfect snack to gobble on when you feel like munching something salty and savoury. This is the day when guests are welcomed with all these above-mentioned delicacies. So, if you happen to be lucky enough – these Holi special food will surely leave you confused with which one to gobble on first!